One of my more popular blog posts was about splitting PDF pages. I wrote that post five years ago and I am still getting regular feedback and questions. In Acrobat X and XI we also have a different method of running the script: We can create an Action using the Action Wizard that takes one or more documents and creates new documents with the split pages. The biggest advantage an Action has is that you can install it by just double-clicking on the SEQU file. The biggest disadvantage of an Action is that it only works for Adobe Acrobat Pro – the Standard version does not support Actions. So, let’s take a second look at the page splitter script and make it easier to install for users of Adobe Acrobat X or XI. If you have Adobe Acrobat Pro, then use the following links to download the Action file. It will have a .sequ file extension, and when you double-click it, it should ask you if you want to install it in Acrobat. You can install and run the Acrobat X Action in Acrobat XI, but you will not be able to edit it. The actions will automatically split one or more documents and will save the document with a “-split” added to the original filename in the same directory that the original document is stored in. So, if you have a document named scan.pdf, you will get a new file that is called scan-spit.pdf in the same directory that scan.pdf is stored in. For Acrobat XI Pro users, installing the Action is the easiest way to get access to this functionality. After this script is installed, and you restart Acrobat, you should find a new menu item at the bottom of the “Edit” menu in Acrobat. Differently from the Action, the “Split Pages” function will create a new document, but will not save it. It’s the user’s responsibility to save this file. OK I really like the idea but for reasons I don’t understand it is not working for me. 2) I downloaded the splitpages.exe file, closed Acrobat, ran the EXE file, started Acrobat XI (I’m running Win10 x64), open my file, clicked the Edit, in the dropdown I still do not see SplitPages. Forgot to mention I did update the preferences as document above. 3) Using Everything (search tool) I looked for Splitpages.js and there is only one file and it is in the correct folder per the instructions above. I would add a debug alert message in the script to see if it gets loaded at all. You can do this by adding “app.alert(“script is loading”);” to script, but make sure it’s outside of any function body. Thank you!!!! I’m a librarian and we often scan 2 pages at once from books, this script has made my job so much easier!!! Agus, right-clicking to download is a pretty standard command in many browsers. Actions from older versions of Acrobat can be executed in a newer version, but it cannot be modified. That’s the case when going from e.g. Acrobat X to XI as well. Hi Karl, how can I make it work under macosx? Tricia, this should work on a Mac as well. Look through the page, there is the path you need to use for installing it on a Mac. Keep in mind that this article is more than 3 years old, and was written for Acrobat XI, so if you are trying to use this with Acrobat DC, you need to adjust the path. Hi again, please don’t worry about my question, after some research I’ve found the way…Thanks!!! Please kindly look into it! Looking forward to the Action! After reading the comment, I know I made a silly mistake! Thank you SO MUCH for the Action! It worked perfectly! Have been searching for a solution for hours so thank you so much for your selfless sharing! Can it work for Adobe Acrobat Reader DC? I’ve been trying it and it’s not working. Sentience, no this will not work with the free Reader. Reader cannot modify PDF files (with some very limited exceptions), which is necessary for this functionality. This is slick. Exactly what I wanted. A feature that Adobe should have included straight out of the box. I wanted Action File for Acrobat XI Pro. I clicked, but instead of downloading the .sequ file it opened an .xml in the browser. I copied the content to a notepad and saved as .sequ. Unfortunately, it refused to work. In any case, I have some further advice for people using this to clean their PDFs to make them beautiful. Finally, open the Crop Box again. You will see that all of the areas outside the Crop Boxes you defined before are gone! Now you can *add extra white space* by using the “Change Page Size” portion of the menu by selecting “Fixed Sizes” and picking the size of virtual paper you want from the drop down menu. [see note 2] Then under “Page Range” select “All”, hit OK and you have beautiful, highlight-able, copy-paste-able, margins-for-notes-able PDFs where every page is the same size. Hello Karl, it works perfectly with Acrobat DC! Just what I needed! I have some files with single first pages and others with double first pages. Is there a way to get both .js functions to appear and work in the “Edit” menu (of Adobe Acrobat DC) so I could chose the correct function based upon first page type? Chris, you have to make sure that the cName (and cUser) information is different in the call to app.addMenuItem(). I assume that your two scripts use the same name for the menu item, and that will not work. This tool looks great, and it’s free! Thank you. Can you change it to split the page horizontally and not vertically? Fantastic solution; thank you so much for sharing it, and for maintaining the instructions as time marches on! Joel, yes, you need to change the cropLeft and cropRight to be top and bottom. Karl, I tried changing the cropLeft and cropRight to be top and bottom, but it still continues to split the pages vertically. Christopher, unfortunately I don’t have the right now to work on a solution (my paying customers always come first). When I find some time, I will take a look. Thank you. I found a temporary workaround. I rotated the pages 90 degrees, ran the split, then rotated the pages back. Seemed to work just fine. I’ve been looking for hours, even tried the suggested “quite imoposing” demo for nothing..this is just perfect! thank you! By the way, do you have the opposite? Merging 2 pages into one page? I have a pdf compose of pure half images. And I have to do it by batch since it is about 68 (half image) pages long. So in the end I will only have 34 (whole image) pages. Thanks again! hi! when i click on the Action download, a new page opens that says the XML file does not appear to have any style information associated. the document tree is shown below. what do i do after that? Dawn, it sounds like your web browser is opening the XML file. Right-click on the download link and select to save the file so that it does not get opened. Jelly, this can be done using imposition software. And no, I don’t have a solution for that. Just google for “PDF imposition” and see what you can find. My tool of choice is Quite Imposing Plus (http://www.quite.com). This may be a bit too expensive for just one job however. Scott, it sounds like there is something wrong with how user interface items are being displayed on your screen. I am not aware of any problems that would result in that, or how to fix this. If you want, you can send a screenshot to me via email. My email address is on the “About” page. A very neat solution which I downloaded very easily. My only issue is that when I split a page and save each half as a separate file, they are both the same file size as the original double page file. This suggest the software is “hiding” the unwanted part rather than actually deleting it. The result is that the new “book” is twice the size of the original “book”. Or am I missing something here? Brian, whether the file will get smaller or bigger depends on the original file. You are right, we are not removing any information during the actual splitting process. However, some PDF files contain extra data that might get removed when you run this routine. Here is an example. I have a InDesign document (PDF file created from within InDesign). This file has 28 pages and it’s size is about 740KB, when I run the action I end up with a file that contains 56 pages and is 387KB. As you can see, we cut the file size in half. This is not typical, but can happen. When I take the original file and remove anything that is not absolutely necessary to display the pages (that is all meta data and data that InDesign thought might be good to have in the PDF file), I end up with a file that is 218KB in size. When I split that, I end up with a file that’s again 387KB, so in this case we went up, but not by a factor of 2. Acrobat will try to optimize the file, and it knows that we are using the same content on two pages, and it will try to re-use as much as possible from the content that was already used on page 1, when it creates page 2. If you want to remove the extra (now hidden) content, you can use either Acrobat’s “Remove Hidden Information” tool, which however very likely makes the file much bigger (2.5MB in my example) because it needs to rasterize certain content, or use the “Remove page objects that are completely outside of crop area” preflight fixup. This will bring down the file size slightly (in my case to 360KB). This will not give you anything smaller if your source file contains e.g. a scanned image, because the whole image would span the area from within the crop area to outside of the crop area, so such an image cannot be removed buy this fixup. In this case, the “remove hidden information” function may give you better results. Dear Mr. Kremer, Thank you so much for offering this wonderful solution, it does precisely what I need. However, I do have one question. I often scan A3 examination papers being a teacher and when running the split action I end up with scans with pages out of order. Is there anyway, I can set the action to reorder the pages based on the number of pages entered. I can do it manually but would like to automate the process. Many thanks. Everything works. I’ve got a 17.85 x 11.0 Tri-fold PDF and when I use this it splits the PDF into only two PDF’s, 8.92 x 11.0. How can I get this to split into three equal parts? What am I doing wrong? Thanks! Hi MK, the software as presented in this (and the earlier) post only handles splitting a PDF page into two. You can however modify the script to handle trifold documents as well: This would require that you end up with three copies of each page instead of just two, and then crop out one third of the page instead of half. This does require some programming, but it’s certainly possible. If you need professional help with this, feel free to get in touch with me via email. Amazing. Thanks! Works as advertised in Acrobat XI Pro. Wow. Thank you. This worked perfectly. This is a very helpful tool! Thank you for that! I had no issues when I was using split pages on Acrobat Pro, but now with Acrobat DC 2018, after I split pages, I no longer see the split pages in the crop mode (page thumbnails). Instead, I see the original page (before splitting). Why is this and is there something I can do? Henri, I have not tried the script with the latest version of Acrobat. When I find a free minute, I’ll give that a try and let you know. Hi, just a quick thank you for this script! I have used it to make the manual for my Panasonic SD-2501 bread maker more accessible, so I can read it page-by-page on by Sony Reader in the kitchen. I just used the Action File approach in Acrobat Pro DC (19.008.20080). Worked like a champ. Thanks! Matt, it’s hard to say what’s going on without seeing the file. In general, when you “split” the pages, you are actually adding a copy of the page you want to split, and then crop one copy down to the left half, and the other copy to the right half. This will create some overhead, but should not triple the file size (it should not even double it). how can i edit the script for right to left documents (languages)? Just swap the two crop boxes that cut out either the left or right half of the page. Fantastic. Thank you. Tip on its way! @GD: Appreciate the tip! Happy New Year! Thank you very much for this, Karl. I just installed the script on a Mac (OS X Mojave, Acrobat Pro DC build 2019.010.20069.311970) per your instructions. After restarting Acrobat Pro, “split pages” was available in Tools -> Action Wizard. One difference I noted from earlier instructions, or descriptions is that the new (split) file doesn’t open in Acrobat; rather, it’s saved (in the background) as a copy in the same folder as the original and with -split appended to the filename. 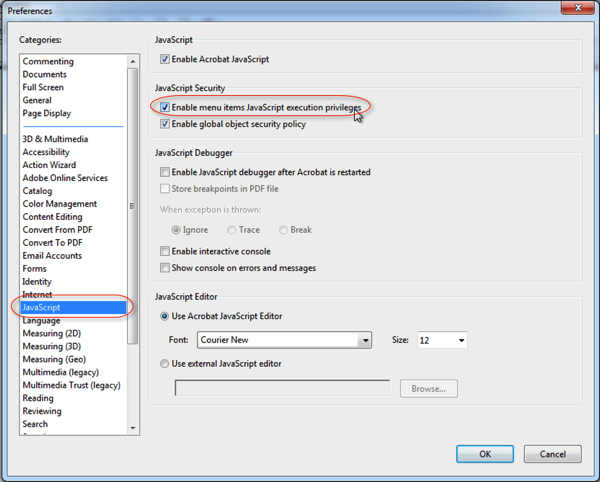 Instructions for using the script with earlier versions of Acrobat indicated that it was necessary to save the file manually, which is no longer necessary. Incredibly grateful for your work on this and your willingness to share it. It’s going to make a big difference to the many students, faculty, and staff at the college where I work, who are increasingly turning to devices to read documents/articles, rather than printing to hardcopy. Included among these are individuals with text, vision, and related disabilities, who benefit from single-page format documents.